This morning we woke up at White Rock Resort in Subic, tonight we’re sleeping at the Holiday Inn at Clark, Pampanga. It was another very early morning, starting with a 6am check out. We had a brief tour of the resort before heading out to the Lighthouse Marina for our breakfast. We were also there for the beach clean up event, though after the usual niceties, we boarded the bus again for a ride to the port. We were supposed to go on a cruise around the bay in a yacht, but since it was a weekend and everybody and their dogs are in town, we ended up in something that looked like a service craft. Still, it has a motor and it looked sea worthy. The mountains around the bay were pretty and the water was dotted with huge ships that is either waiting for cargo or has just unloaded. The boat puttered close to a couple of ships and they’re HUGE! The crew onboard looked like tiny ants waving in their hard hats and jumpsuits. We circled the bay and went back to the port after about an hour. Back in dry land, we zoomed to Mountain Wood, White Rock’s sister resort with a really spectacular view of the surrounding mountains. 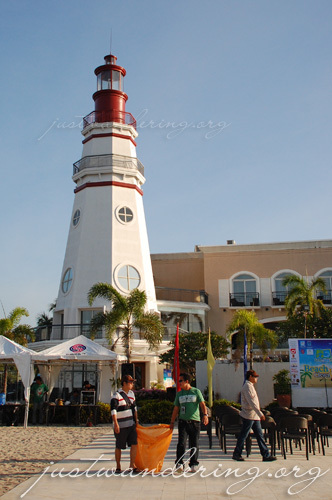 Subic is also known for duty free shopping and recently, outlet stores. We took an hour from our hectic itinerary for a short shopping spree before heading back to Lighthouse for lunch. Our destination for the afternoon was Tarlac, particularly the Aquino Center and Microtel inside Hacienda Luisita. The Aquino Center houses a museum dedicated to all things Ninoy, and some of Cory’s. After the museum, we proceeded for a press briefing with the Tarlac Conventions and Visitors Bureau to learn about Tarlac’s tourism potentials. The traveling is not finished, as we made our way back to the SCTEX and into Clark. We pulled up to the Holiday Inn just before 5pm, leaving us with just enough time to freshen up before heading back out for a quick tour of the hotel, then walking to Red Crab for dinner. Dinner was everything you’d expect from Red Crab: yummy. We enjoyed it too much, I think, because our table was the loudest in the group, telling jokes and roaring with laughter. This is our last night together, and we’re making sure we enjoy every minute of it. Before calling it a night though, we stopped by the Holy Angels University in Angeles to learn about Pampanga’s rich history and culture. We took in more culture, though through food, at Camalig where we sampled their different kinds of pizza with distinctly local flavor. We were feeling the effect of being together 24/7 for the past six days and we were all quiet on the ride back to Holiday Inn. Tomorrow is our last full day together, and though I’m sad to part with this amazing bunch of people, I have to admit I’m quite excited to go home to Quezon City (and stay in one place for more than 24-hours). 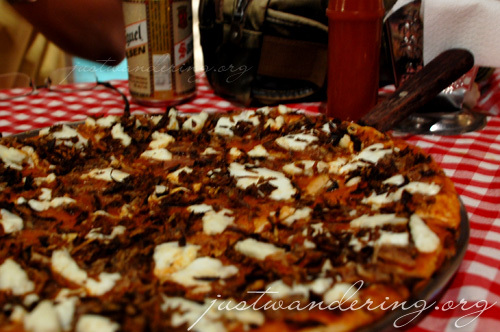 We were really excited to Camalig after seeing the yummy looking pizza on Ivan’s blog a few years ago. Sadly our order did not look the same. My friend complained of the same thing when they ate there. I don’t know if it was a bad day or if they just treat certain customers differently. Sayang. Great photos pala and your pizza looks good too! Love the pizza. Better than the plain pepperoni or whatever we got here in LA.